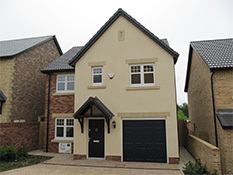 McKenna (Plasterers) Ltd have a long history of producing high quality External Render work for a wide range of clients. Our depth of knowledge and expertise means that we fully understand the requirements of any building project and we are able to deliver the right render solution. We aim to meet and exceed our clients' expectations whether working on a private property of a major house build or development project. Location Off Elm Park Terrace, Shotley Bridge. 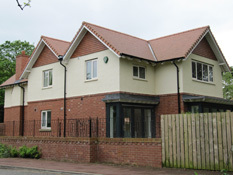 Description of works Render new build properties. Expertise required Parex Monorex, colour J39, roughcast textured finish, spray applied with TV10 mesh cloth reinforcement to potential stress points. Problems to overcome Work to main contractors programme. Timescale Sep. 2013 - Jun. 2014. 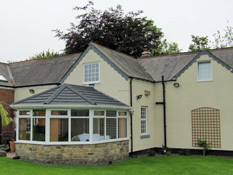 Location Willow Cottage, Summerhill, Shotley Bridge. Description of works Render existing property to give a continuity of finish, following numerous external repair works over the past years. Expertise required Parex Monorex, colour J20, roughcast textured finish, spray applied to a Parinter key coat with TV10 mesh cloth reinforcement embedded within to the full rendered substrate. Works completed whilst client was on holiday. Problems to overcome Loose existing render removed by M(P)L, conservatory to negotiate by liaising with scaffolding company and miscellaneous cracking to substrate overcome by the use of mesh cloth reinforcement. Developer Alderson Building Services Ltd. 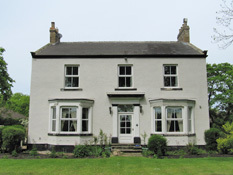 Description of works Render existing house and extension. Expertise required Parex Monorex, colour G00, roughcast textured finish, spray applied to a Parinter key coat with TV10 mesh cloth reinforcement embedded within to the full substrate. Problems to overcome Existing paint and render removed by developer and miscellaneous cracking to substrate overcome by the use of mesh cloth reinforcement. Location Off Green Lane, Stannington. Expertise required Parex Monorex, colour J20, roughcast textured finish, spray applied with TV10 mesh cloth reinforcement to potential stress points and Parinter key coat to the full substrate.